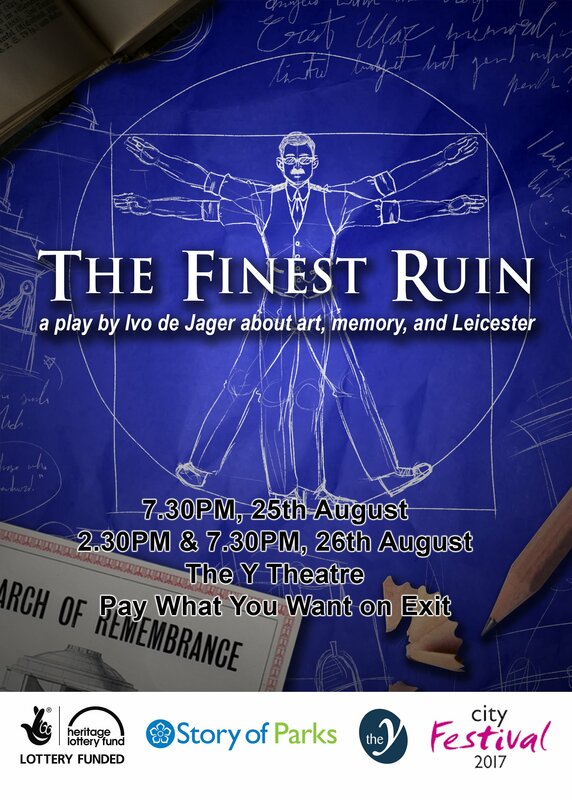 Returning for a second year as part of Leicester’s City Festival 2017 celebrations The Finest Ruin an original play written by Igo de Jager, is showing at The Y Theatre during the August bank holiday weekend. If you were lucky enough to see it last year, you will know that the performances are inspired by the Arch of Remembrance, the war memorial in Victoria Park. The drama flicks between the 1920s when it was being designed by world-renowned architect, Sir Edwin Lutyens, and the 1950s where two women from diverse cultural backgrounds happen to meet under the shadow of the Arch and become friends. All three reflect on the meaning of art, friendship and remembrance whilst exploring what the Arch has come to represent for the people of Leicester. The real Lutyens did in fact design Victoria Park’s Arch of Remembrance in honour of the 12,000 men from the city and county who died in the First World War, as well as the pair of recently and beautifully restored park gates and the park lodges that you can see from London Road. Over the course of his career, he designed fifty-eight First World War memorials, such as the Cenotaph in London, the memorial to the Battle of the Somme’s missing in Thiepval and India Gate in New Delhi, which shares a similar style with our arch. India Gate stands in remembrance to the 82,000 Indian Army soldiers who lost their lives during the period. In June, there was an event run by ‘The Unremembered’ project that connected the two memorials in Leicester and New Delhi together to remember these soldiers. These beautiful monuments to loss and memory act as a catalyst for people to engage with the past, which is what the characters explore in The Finest Ruin and we do today as the centenary of the end of the Great War draws nearer. The play was very well received last year and if you’re interested in watching a great piece of theatre as well as learning more about the story behind one of Leicester’s most beloved landmarks, then tickets are available to book here. This play was written as part of Leicester City Council’s Story of Parks project, which is funded by The Heritage Lottery Fund and is ‘Pay What You Decide’ – Donations can be given at the end of the evening. There are three performances of The Finest Ruin, 19:30 on the 25th, 14:30 and 19:30 on the 26th.